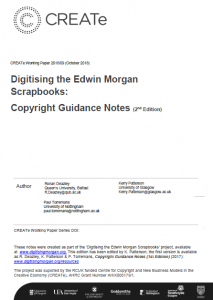 This paper reports findings from a rights clearance simulation on a culturally significant set of unpublished scrapbooks created by Edwin Morgan, the first Scots Makar. Although unpublished, the scrapbooks are replete with orphan material, such as cuttings from newspapers, magazines and books. The researchers conclude that mass digitisation and diligent search are fundamentally incompatible, however light-touch the diligent search obligation might be. This paper compiles twelve Notes exploring copyright issues commonly encountered in digitisation projects, designed for use by cultural heritage institutions. Written by specialists in copyright and archives, they should be regarded as guidance and not legal advice. They are designed for users in the UK. The Notes should be accessible for those without a law background, but contain legal references to give them enough weight to be of use at all levels of decision making. 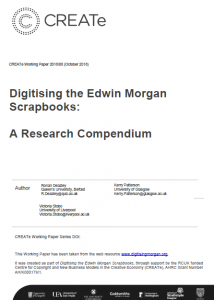 Each document provides a legislative context and outlines practical implications, including examples from the Edwin Morgan Scrapbooks. This entry was posted in CREATe Blog, Working Papers. Bookmark the permalink.